Buying tea and shopping for deals can be confusing. The landscape of vendors is intimidating and oftentimes a simple purchase at the cheapest price can be a mistake. Complicating matters, there are no consistent quantity standards and varying shipping policies only add to the already-considerable confusion. This article will attempt to illuminate many of these issues, while specifically analyzing Gaoshan (Taiwanese) high-mountain tea by examining how tea prices vary mountain to mountain and vendor to vendor. High-mountain oolong in particular tends to command the most-demanding price/oz and oftentimes what may seem like a deal is not really a deal at all. Check out our vendor guide for a vendor by vendor breakdown of Taiwanese gaoshan specialists. Please note that high-mountain tea (>1000 meters) excludes many popular Taiwanese teas like Dong Ding, Tieguanyin, Oriental Beauty, and Baozhong (all grown at lower elevations). What is the price of high-mountain tea? What is average? What is premium? I first compiled the quantity, cost, and cost/oz of non-ebay vendors specialized in Taiwanese tea by high-mountain type (non-Jinxuan Alishan, Lishan, Shan Li Xi, DaYuLing) of quantities between 0.5-2 oz from Spring 2013 harvest. These bounds substantially limited the amount of entries. While 2 oz is somewhat arbitrary as an upper bound it’s about what I qualify as a small sample size. This disqualified 75 gram/2.64 oz quantity sizes from two popular vendors, Tea from Taiwan and T-Oolong. For the sake of simplicity I didn’t include shipping costs in any of the calculations, although it should be considered for any actual purchase. 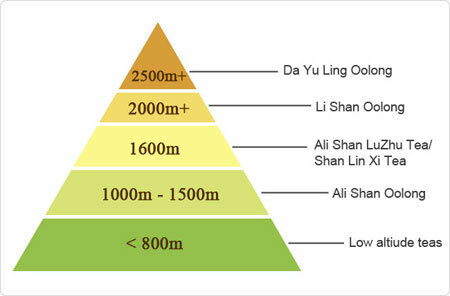 Alishan is a good standard baseline to compare future price points. It’s the most common and affordable of the popular high-mountain teas. From the table we can see that nearly every vendor offered a different quantity making our data crunching especially useful for price/quantity comparisons. Both Origin Tea (international shipping) and Taiwan Tea Crafts (free shipping on orders >$25) have highly affordable options, with Floating Leaves (free shipping on orders >$80) and Naive Tea (US domestic shipping) being somewhere in the middle, and the two offerings from TeaMasters (international shipping) priced substantially higher than the other four vendor offerings. Harvested at higher-elevations, Lishan unsurprisingly fetches a much higher price than Alishan ($11.29/oz). Again, Floating Leaves and Naive Tea are about at the average (interestingly both are US based). Origin Tea not only offers three different Lishan teas, but they are all quite affordable. The most eye-popping number is Mountain Tea’s stupidly cheap Lishan, at $5.50/oz. This can perhaps be attributed to Mountain Tea operating their own farm and in essence cutting out the middle-man (they also ship US domestic!). As a side note, the average price goes up to a whopping $17/oz. ($16.95/oz) without the Mountain Tea offering. Despite having only four vendors we can clearly see that Shan Li Xi tea is priced squarely in between Alishan and Lishan; This trend holds true for average price and all four vendors individual prices, an observation that holds true for my own personal experience as well. Amongst the four vendors, many of the same trends emerge. Origin Tea is inexpensive and Stephane’s is not. Da Yu Ling lives up to it’s premium reputation with the highest average price. It’s also the most expensive tea for three of the four vendors, Taiwan Tea Crafts being the exception. Interestingly, this is the only tea where Origin Tea is not one of the cheapest vendors. Unsurprisingly, tea price has a strong positive correlation with altitude. So you’ve sampled the spectrum and you know exactly what you know you like. How much money are you saving by buying in bulk from your favorite vendor. I crunched the numbers for the most affordable and common (Alishan) and the most premium (Da Yu Ling) for quantities between 2-5.3 oz (150 grams). The average price has gone down by over 20%, a substantial saving. However, the savings are largely aided by Tea From Taiwan and T-Oolong, whose smallest quantities are 75 grams/2.64 oz (and were not included within the first table). Without either of these two the savings are more marginal, under 10%. Only a few vendors, notably Floating Leaves and Teamasters, actually offer a significant discount. Origin Tea and Naive Tea have no discount or a miniscule price deduction. Taiwan Tea Craft’s discount (~5%) is also unimpressive considering the significant rise in tea quantity from 0.88 oz. to 5.3 oz. This confirms alot of what we saw from the Alishan bulk prices; Nearly every single vendor offers virtually the exact discount and quantity. For those interested in premium teas, Teamasters is a good target to buy in bulk as Stephane offers a strong bulk discount (>20%) and because of the high shipping cost from Taiwan. For those interested in buying in bulk it’s also important to note that high-mountain tea should be consumed relatively promptly! Originally when compiling this data, I had a number of ebay vendors and tea generalists (Hou de Asian, Red Blossom, Tea Trekker) included. Unsurprisingly, both of these vendor-types threw the numbers off considerably. Tea generalists prices veered a bit higher than Taiwanese tea vendors, while ebay prices were far cheaper than average. With prices like $3.30/oz for Alishan (Teahome) and $4.48/oz for Da Yu Ling (zen8tea), it’s hard to resist just going straight to ebay. So… what about the tea on ebay? Were all these statistics just empty fluff when the real deal is elsewhere? Not exactly. Nearly every tea vendor on ebay will be based somewhere in Asia. The convenience of being near the source allows ebay vendors to acquire a larger selection and offer them at smaller profit margins than many west-based vendors. Sadly, this does not ensure the best or even particularly good tea. The ebay market is saturated with forgeries and many vendors will sell old or simply bad tea. Despite this, there is definitely still a time and place for ebay, although I’d recommend against it for intermediate and expert tea drinkers. Here are some of the advantages and disadvantages to buying ebay tea. Tea will almost never be top-tier. High-mountain tea is a premium commodity and can be very expensive. For interested newcomers, I’d recommend buying a wide variety of high-mountain teas in small-quantities to sample and figure out what you like. Only buy in bulk if you trust the vendor, are sure of what you want, and are sure that you are getting a discount! Beware of ebay. You get what you pay for and oftentimes the same teas (Alishan from ebay vs. Alishan from Floating Leaves) can vary dramatically in quality. While non-ebay vendors command higher prices, reliable vendors give a strong guarantee of authenticity and quality. This entry was posted in Article, High-Mountain Oolong, Long-form Article, Oolong, Taiwanese Oolong, Tea Learning and tagged Floating Leaves, Mountain Tea, Naive Tea, Origin Tea, T-Oolong, Taiwan Tea Crafts, Tea from Taiwan, Teahome, Teamasters, zen8tea. Bookmark the permalink. Good write up. I’m always seeking the best prices with the best quality and this is often why I do buy in bulk. This is a generalist vendor, but I often trust their sourcing. Ryan, thanks for the comment! Rishi offers excellent prices ($8.52/oz Lishan, $10.22/oz Da Yu Ling) and 50 grams is a very reasonable quantity to purchase. I haven’t ordered from Rishi, but I’m aware that their reputation has risen considerably in recent years. I am familiar with Rishi teas, they are a bulk vendor and I can get their teas at Whole Foods and the food co-op I belong to. The teas I have had are what I call “drinkers,” uniformly pleasant, no-fail brew and storage, a daily drink-it-up and easy for people who don’t want to put a lot of thought into their tea. I include their pu-erhs in this assessment. You won’t get a bad tea, but in my opinion not a very interesting one, this is not meant as an insult at all, I could refer a new tea drinker to their teas with total confidence. What I am looking for now is curation. I have only been a subscriber here at teadb for a couple of weeks and I have already got a good handful of referrals to smaller, independent tea vendors, access to people who can and are doing the travel to offer interesting teas at affordable prices. My point is that for the same price I can pay for bulk tea locally will also buy me a decent cake or ounce of something I have never tried before. I am really appreciating the curation going on here with James and Denny and the people who post comments. Thanks for the kind words and I think your assessment of Rishi seems somewhat accurate. I also agree with your view on independent vendors. There are some very good vendors to be found and very interesting teas to be drank, if one seeks them out! I’ve visited one of the best tea farms in Taiwan’s Alishan. The owner also has a hotel a little ways down the mountain, and my Chinese boss owns half of that. As a visiting computer engineer, the tea farm owner gave me a tour. He said I might be the first white person the mountain dwellers had ever seen visiting their area. Tourism isn’t that big in Taiwan. The tea is farmed by aboriginees, who to me are indistinguishable from the rest of the Taiwanese. They’re said to have bigger feet for mountain climbing, and shun desk jobs. They like physical work. At tea farm closing, they drive down the mountain in blue trucks loaded up with people, to go have evening fun. One interesting thing, though a bit controversial, is that California’s new marijuana law might ultimately lead to the Taiwanese growing pot on those mountains. They have excellent conditions, and marijuana fetches at least 5 times the price of the best tea. There’s already some discussion of it there. The result might be very bad for tea farming. I expect the natives (who have alcohol issues) would also embrace marijuana. Taiwan might be the first to grow it openly, China would resist (though it actually already grows there in abundance for thousands of years).